In short, this is a technology that could potentially replace all roads, parking lots, sidewalks, bike paths, recreational areas and anywhere that currently uses standard tarmac. It could even create a system of sustainable energy for entire countries. In reality, it’s more likely to be used — at least for now — by private individuals rather than governments. But the potential is vast. Unlike traditional solar panels, this technology would work with smart, micro-processing, interlocking hexagonal panels. The top of each panel is covered in tempered glass that can withstand high-load and impact requirements as well as providing the same grip as tarmac. Every panel also has a series of LED lights on a circuit board that can project a design as the panels inter-connect. It means that the road itself — all or just part of it — could self-power to light up ahead. This would negate the need for road markings and streetlamps and offer vastly improved visibility. Warning messages could be flashed up to alert drivers of hazards ahead. They could also be programmed to recognise weight configurations and light up or flash warnings to highlight dangers ahead. Anything from a camel wandering into the road or a huge landslide could be flagged up to motorists. The same technology has a host of other uses. Parking lot configurations could change at the push of a button. A recreational area could change from five-a-side football markings to basketball markings by flipping a switch. Anywhere that requires some sort of marking on the ground could be illuminated via this technology. For use in the colder countries, one version of the panels has been developed with additional surface elements that ensure they warm to a few degrees above freezing so snow and ice can’t settle and thus ensure the roads are clear in winter weather. Currently, the solar road technology is being tested via private driveways and parking lots, but the potential for government highways and private businesses is there. The idea is that they generate electricity, and therefore capital, and ultimately pay for themselves. It would also help create charge points for, so drivers could recharge their cars in carparks while they shop or work. Eventually, you’d be able to charge while you drive via mutual induction panels and it could make electric vehicles truly viable. 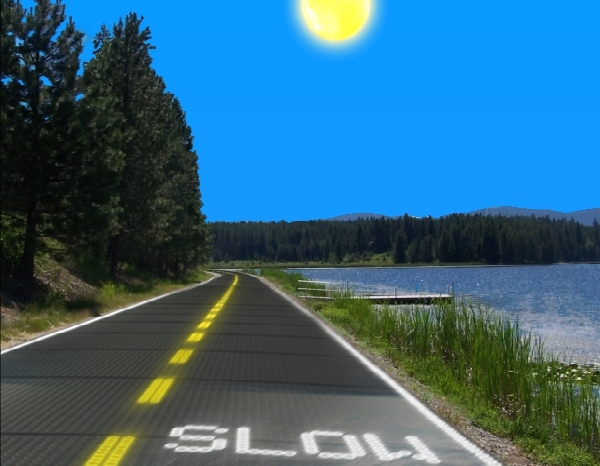 Solar Roadways say they have “received two phases of funding from the US Federal Highway Administration for research and development of a paving system that will pay for itself over its lifespan,” and claims that if all the roads in America were solar powered they would generate three times as much energy as the country now uses. In many ways, the UAE would be the perfect place for solar roads. We have the sun, the government has the capital to make an initial investment and a leader who has constantly, and laudably, indicated that he has ecological interests. And, unlike many cities in other parts of the world, there are still a lot of roads and spaces that need building from scratch as well as lots of space to build into. It’s likely though, that it will all start via private companies, but if proven to be effective, this could be the start of a real solar revolution in clean sustainable energy.